Is that "Hoster's Beer" advertised across from Old Bull? My other thought was "Fowler's". Wow, the similarily of the new pictures to the old pictures really got me thinking. IMHO, most of the AT buildings aren't really "beautiful". Interesting, maybe, but the new giant parking deck... not really attractive. I'm all for preserving history and not creating more strip malls, but were these things really worth preserving? To me, the architecture of these warehouses is directed towards the inward spaces. They don't direct people into an outward common space such as might exist in a city plaza or the ancient agora. This bothers me. Recently, I was at the MOMA and watched a video about the remaking of some Eastern? European cities urban core. Instead of saving all these industrial buildings, they were envisioning new open space, green buildings, effecient building techniques, and an architecture that brought people together and enabled people to live car free. AT doesn't do this for me. I don't know. I love this blog, and read it everyday. I love history, but I hate to feel stuck in it. Somehow these buildings make me feel stuck. Maybe it is the fact that tobacco is such an agent of death in the world. Are old tobacco warehouses the best we can do? Here's to hoping the DPAC is a work of art! Gary, another great, concise but informative entry. And what -- were you hanging off 147 to take that contemporary picture of the Fowler building?! Maybe you didn't feel the need to comment on it, but the most interesting thing to me about the drawings of the Old Bull in the Roberts's book is the erection along the roofline of the three huge portraits of the owners (Day, Carr, and Blackwell). Talk about audacity! DCR - Indeed, it is Hoster's. Looks like it came from Ohio. I think the developers made a conscious choice to focus the redevelopment towards the center. It wasn't the only choice they could have made - they could have created an active Blackwell Street, Carr Street, or West Pettigrew. While I do think these buildings are beautiful, I'm not a fan of inwardly-focused development, which I think makes AT feel insular, as if it turns its back to the Durham on either side. These buildings were never designed to support ground-floor street/sidewalk activity - on any side. Maybe that's what turns you off? While I think the warehouses are beautiful, I'm more fond of historic retail buildings that were intended to interact with the pedestrian. We certainly have plenty of space around this to create something interesting and new - as you point out with the DPAC. While I didn't support it at that price, since we've gone down the path, I wholeheartedly agree with you - I hope it's beautiful and enormously successful. Tobacco's pretty tough - we'd pretty much have to tear down the whole town. We can take some solace, I guess, in the notion that the vast majority of that money and construction occurred before anyone understood just how bad tobacco was. Indeed, I scrambled up the embankment to where it met the overpass. Less scary than trying to take a picture down the middle of Gregson St. last week with my back to traffic. I agree - I wondered whether those really existed. Seems over-the-top, even for those guys. At the time of the civil war life was "nasty, brutish, and short". You can't blame those guys for wanting to smoke tobacco as a break from everyday drudgery. Thanks for a great article. I knew some of the history behind the ATC, but having all the pictures in front of you at the same time really brings things together. And yes, they may not be beautiful buildings, but it is alomst impossible to describe the history of Durham without them. Superb, Gary. As always. Makes me proud to be moving in to Old Bull in a month or two. Thanks so much for compiling this information. As always, you have done a masterful job of conveying the evolution of this site. It's refreshing to read a post that doesn't end with the phrase "these buildings were demolished in the 1960's using urban renewal funds". I think there is absolute beauty in the sheer scale of these structures, as well as in the massive timbers and elegantly detailed brickwork that define them, and I am thrilled with their preservation and restoration. I agree that opportunities were missed that could have created better public spaces and stronger connections to adjacent streets and the ball park. I also feel that the demolition of several bays of the Washington Building for a parking garage was regrettable, and wish that more of those ground floor windows were full of retail shops instead of office cubicles. But by all measures this is a visionary project that converted a hulking razor wire surrounded nightmare into a tremendous asset. Capital Broadcasting and everyone involved in making this happen deserves an enormous thank you from all of us who care about Durham. One question: What the heck is that Jetsons looking structure hovering in the background of the 1930's photo looking NW from Moorehead & Blackwell? RWE, I believe that's the steel frame of the under-construction Hill/CCB/Suntrust building. I think he means the structure west of the CCB building, which seems to be floating above the Washington warehouses in the one picture. It does seem anachronistic at first glance. Thanks, everyone, for the kind words about this post. Rob, I couldn't agree more about the importance of this redevelopment. I'm not sure any one thing has done more to change outside perceptions of Durham, and even Durham's perception of its downtown. I point out criticisms of the inward-focus, because I think it's still the instinct of developers, particularly given the dismal streetscapes through much of this part of downtown - solving that has to start somewhere, though. I'm curious as well about the strange thing above the Washington warehouse - I guess it could be a cooling tower; I don't know how early AC was available for industrial settings - particularly where it would have a dramatic effect on helping control humidity, etc. for tobacco. But that's just a wild guess. I want to add my voice to this post. I lived in Durham from the 70s to the early 90s, and have watched in semi-horror as my "old Durham" expanded into some suburban, LA-lite hell. I love downtown, the old downtown and all. Recently, I spent a while in Durham, and I could not BELIEVE how amazing the new AT campus was. Sure, I knew the ballpark from a few years back, but the restaurants, the courtyard, the general sense of urban life, it was great. Sure, you have to drive to get there, but once there, you have options and it's just lovely. Would open spaces, etc. be better? Not so sure. Look at Greensboro's downtown and how they built that park (name escapes me). You can't have too much open space if nobody actually GOES there. The AT campus was full of people. That's what you need. So, for the Anon who was worried about being stuck in the past, let me say that it's great to have an anchor for the future. As GK mentioned, somewhere down the comment chain, this one revival has done more to help me think of Durham in positive terms than any other change over the years. Thanks for the lovely history. The AT campus is definitely one the best things to happen to Durham in several decades. Sure, it's mainly a daytime-used place because of all the offices (but at least there's Mellow Mushroom and Tyler's), and it is focused a bit too inward, but I'm very happy with how it turned out... especially considering what could have happened to it based on the City's recent record. When it was first completed (well, for the most part), I was shocked AND awed. I couldn't believe that Mayor Billy and his cronies could possibly let something as nice as this happen in Durham! What a great post this is - thanks Gary. I couldn't disagree more with (the first) anon - there is no Durham without tobacco, and razing the evidence of the past does not remove it from being. The complex may not be beautiful to you, but it's beautiful to me. We have no lack of empty space to fill with modern urban designs, without tearing anything else down (thanks urban renewal). I think this has been a wonderful opportunity for Durham to both preserve the past and develop for the future, and it's been executed magnificently (despite any minor quibbles). These tobacco plants used to be the economic heart of the city, and now they have come to be (at least symbolically) the heart of the city's revitalization. Very, very cool - thanks for sharing. It amazes me just how much the Hill building has changed in a few short years - in early 2006 when it was announced Motricity was moving in, Hill had no floors and was missing most of the roof! I think all of the Liggett and American Tobacco buildings that seem to have proper names attached to them are named for various executives of the respective companies. Have you noticed recently that the Fowler building has a large "1" near the top corner of it (actually, it's on both sides of the corner). I see that in your picture ( http://www.endangereddurham.org/Photos/AT_Fowler_NW_031208.jpg ) the number isn't there. I wonder when it went in and what it means. So, just as soon as I ask someone about the 1 on Fowler building a friend of mine tells me it's for "Square 1 Bank" which now has offices on the 3rd floor (and part of the 2nd). Thank you for posting these great photos of the American Tobacco Company. I have enjoyed reading everyone's comments, as well. The American was a huge part of my childhood, and so these photos are bringing back a flood of memories. Everywhere I turned as a child I saw LSMFT, from the Lucky Strike Bullseye on the floor of my Uncle's foyer to the floor of my Grandfather's bar. I could sing the song from the time I - well - since the time I could sing! Some people were commenting on the names of the buildings, and yes, they are named after some of the executives. Mr. Strickland was an exec. and lived on Vickers Ave. across from Allied Arts. He was an uncle of my uncle who married my father's sister, Nancy Fowler. He was a very close friend of the family and a colleague of my Granddaddy. He was a wonderful man who always gave my father a silly, fantastic toy for Christmas (even though he was grown man.) The last one he gave him was a bubble blowing elephant. I, personally, loved it!!! The Fowler building was named after my Granddaddy, Preston LeRoy Fowler, who was in Durham until 1941, when he was sent to the New York office and became the Vice President of American Tobacco Co. The Corporate offices were located in the Hemsley Building on Park Avenue. My grandparents took up residence in the Vanderbilt Hotel where they lived until his retirement in 1955. During the years that they had spent in Durham they always rented the Vickers House on Morehead Ave. It is a lovely home which has now been turned into a hospital of sorts and is being of great service to those in need. My grandparents finally decided to build a home, so they could return one day for good. Granddaddy passed away in 1957 at the age of 73, after only 2 years of retirement. My Daddy, Preston L. Fowler, Jr. was Manager of the plant in Durham from 1959 - 1961 when he died unexpectedly at the age of 42, after being transferred to Richmond to manage the plant there. We remained in Durham and sold the house in Richmond that we had just bought the month before. It is nice to see that the Durham plant buildings are being put to good use. I know that some do not find them very aesthetically pleasing, and there have been so many more architecturally worthy examples that have not been spared, but at least they are a part of Durham's history, so for that reason I am glad they have survived. I have enjoyed this site so immensely and am painfully aware that Durham has lost many noteworthy and priceless historical structures such as Four Acres, Fair View and even the YWCA - what a beauty that was! Thank heavens we have photos of these exquisite reflections of our past. Lois L. Fowler - "Caroline"
Great story! Pulls together a lot of threads with fantastic pictures. Thanks for spending the time telling this important piece of history. 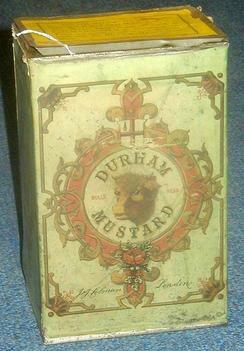 I have been cleaning out some old family boxes and found a package of Genuine Durham Smoking Tobacco, NET WT 5/8 OZ. There is a band around the small package holding an orange colored book of 24 Gummed Cigarette Papers. There is a paper seal keeping the little cloth bag sealed. Other than looking old, the small package in in orginal unopened condition. Lots of those around. mostly from the 50's-60's. It may have been made here if it says Durham, NC on the front label. If it says Richmond, Va., it is 1957 and newer. American stopped packaging it here about 1957 and it was done in Richmond. I have several of those, Durham labels and Richmond. A check on eBay will find plenty for sale, most people think they are older than they really are. Still a nice collectible. I bet it still has some aroma, when fresh that was a great smell from that little bag. The bags and labels were made at Golden Belt, at least into the mid 1960s as I worked there then. 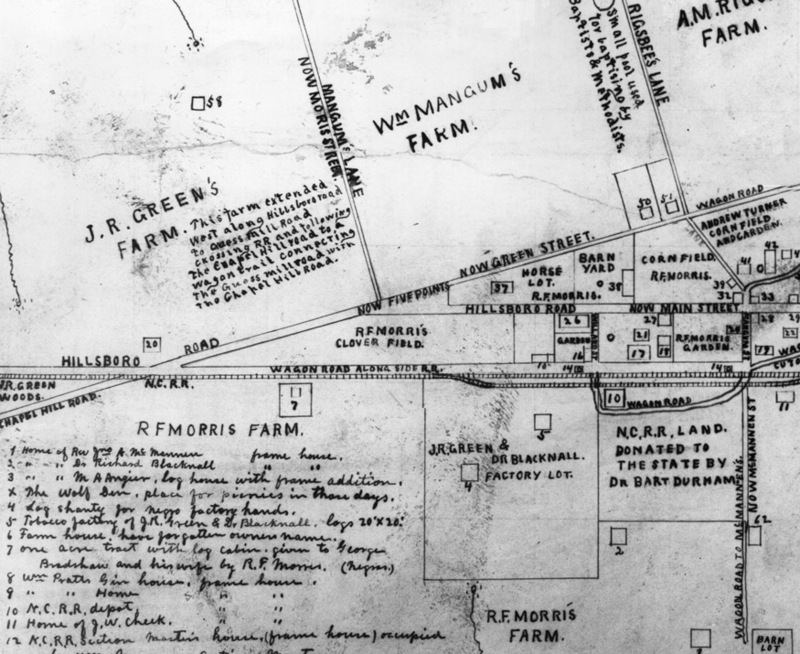 Business was booming, and Blackwell needed additional capital to meet demand. Later that same year, he sold a 1/3 interest in the company to a 25 year old man from Chapel Hill - a UNC graduate and former Private in the Confederate army - named Julian (Shakespeare) Carr. 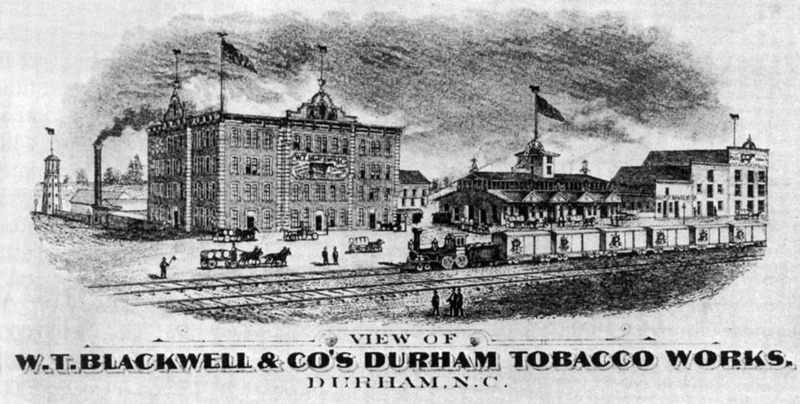 This new capital allowed the partners to begin construction of a factory which would match their growth and ambition; this factory building (which would later be known as "Old Bull") was completed in 1874, the same year that Washington Duke moved to Durham, and 4 years before the W. Duke & Sons Tobacco Co. was established. 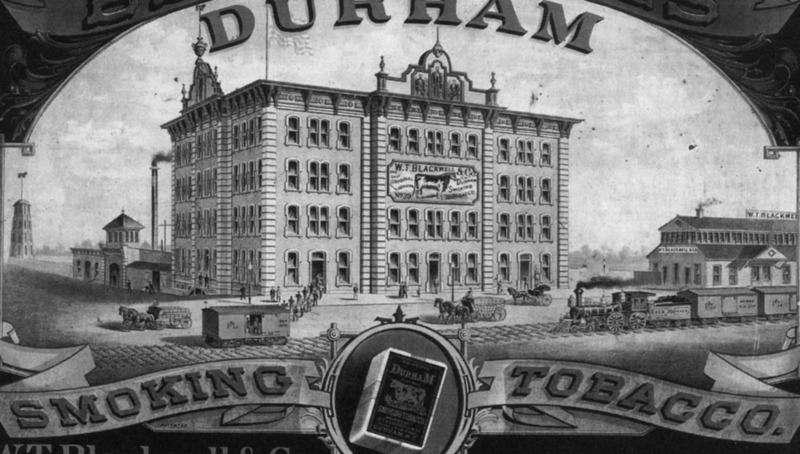 The Old Bull Building was one of the first brick tobacco factories in the U.S.
By 1890, the Duke's American Tobacco Company owned 90 percent of the tobacco business in the county. The ornate brick buildings at American Tobacco and on West Main Street were built between 1887 and 1906. They conveyed a corporate image of power and success. DCR - Indeed, it is Hoster's.